Khara bhath recipe with step by step photos. Mtr style khara bhath recipe is a very popular Indian breakfast recipe from Karnataka. Khara bhath or masala rava bhath is a delicious and flavorful breakfast. It is made with rava or semolina or suji. Khara bhath with vegetables and semolina is a very filling and wholesome breakfast. Popular restaurants like Brahmin coffee bar and mtr serve amazing khara bath with filter coffee. Another popular combination is serving khara bhath and kesari bhath together as chow chow bhath platter. I like rava upma very much and at times I make this masala rava bhath instead of plain upma. 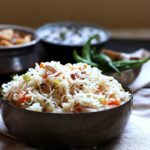 Khara bhath is spicy, flavorful version of rava upma with vegetables. Khara bhath is spicy, soft and melt in mouth with added vegetables. You can make plain masala rava bhath if you do not want or have vegetables. Just use onion, tomato and make rava masala bhath. To make khara bhath recipe use fine sooji or upma rava. That gives this rava bhath a nice smooth melt in mouth texture. Two important ingredients that make this khara bhath special are vangi bhath powder and turmeric powder. If you do not have homemade vangi bhath powder you can very well use store bought powder. If you like rava upma, khichdi recipe, you will like this khara bhath too. Do give it a try, tastes great with coconut chutney and filter coffee. Serve khara bhath with coconut chutney or sambar. Serve a small portion of kesari bath along with khara bhath for chow chow bhath. Khara bhath recipe with step by step photos. Karnataka style masala khara bhath with rava and vegetables! Heat 1 tablespoon ghee in a pan. Roast rava until it is fragrant. remove to a plate. In the same pan add 2 teaspoon oil and let it get hot. Temper with mustard seeds, urad dal, channa dal, curry leaves. Add cashews and fry till it tunrs golden. Add green chilies and chopped ginger. Saute for 2 minutes. Add sliced onions and saute for a minute. Add chopped tomatoes and saute for another minute. Add chopped vegetables. Add turmeric powder and vangi bath powder. Saute well for 3-4 minutes. Add 1/1 4 cup water and required salt. Let the water boil very well. Add the roasted rava in parts and mix very well so that no lumps are formed. Close and simmer for 2 minutes. Add the remaining one tablespoon ghee and mix very well. Serve khara bhath hot with coconut chutney. 1. The given rava to water proportion yields soft but non sticky khara bhath. For mushy texture use 1.5 cups water. 2. You can increase oil and ghee as per taste. How to make khara bhath mtr style with step by step photos. I made this khara bath yesterday and it was wonderful. Just like what I tasted in Bangalore darshinis. Thanks.